‘Pathways to Restore the Feminine’ guides female readers on path to spiritual, emotional, physical health. Author and alternative therapist Kirsty E. Green sees a widespread need for improved well-being among women. 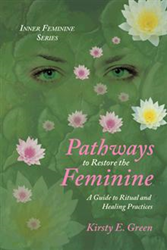 To provide women the help they may need to flourish as healthy, productive individuals, Green announces her new book, “Pathways to Restore the Feminine: A Guide to Ritual and Healing Practices” (published by Balboa Press). Green’s training in holistic therapy and philosophy guides her writing. She draws from her more than 20 years of practice with counseling, energy healing, grief and transition ceremonies and nature meditation to create an all-encompassing guide to wellness. Her new book provides meditations and rituals to enrich readers’ lives and bring them peace and serenity. “Pathways to Restore the Feminine” presents thoughtful and caring words of guidance and inspiration for women, with an emphasis on positive habit creation and overall inner healing. Kirsty E. Green dedicates her life to the use of philosophies that redirect, reawaken and transform the heart and consciousness. Green has worked more than 20 years in the area of alternative therapy. She lives in Melbourne, Australia. Balboa Press, a division of Hay House, Inc. – a leading provider in publishing products that specialize in self-help and the mind, body, and spirit genres. Through an alliance with indie book publishing leader Author Solutions, LLC, authors benefit from the leadership of Hay House Publishing and the speed-to-market advantages of the self-publishing model. For more information, visit balboapress.com. To start publishing your book with Balboa Press, call 0800 0962774 today. For the latest, follow @balboapress on Twitter.